Join us as we take a look at local leaders and hear about their experience with the Quad City Leadership Academy. 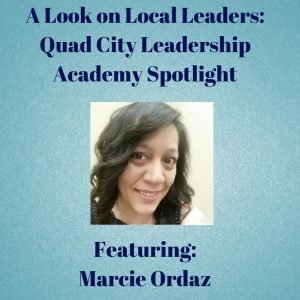 This week, we hear from Marcie Ordaz, Quad City Leadership Academy Class of 2015 Graduate. Where were you when you started the Quad City Leadership Academy and where are you now? When I started QCLA, I was an Operations Manager and somewhat in a slump, struggling to get myself to see my potential and was settling to stay at the management level I was at. About a year following my course completion, I accepted a position as a Director of Operations as well as receiving a 4 year appointment as a State Commissioner on the Iowa Civil Rights Commission! The conversations and exercises we did in class, allowed me to do self-assessments of what I was currently doing and start to think about how I get to the next level. The biggest impact was the resounding message from all of the guest speakers on the importance of having a mentor that can help you face challenges and get truthful feedback. I have always had a mentor that I knew if I needed to ask a question I could. However, following the class, I sought out a local mentor that I started meeting with shortly after graduating from QCLA and it was life changing. He continues to be available when needed and he helped me by asking me tough questions that made me identify with who I am, why I was where I was at, and how to move forward positively and effectively. The experience Ginny and all of the guest speakers provides is priceless. Each class brings real life experience, not someone speaking 2nd or third hand, speaking first hand on all they went through to get where they are today. It is inspirational and educational for self-growth and development. I heard many situations similar to experiences I had which allowed me to self-reflect on what I did right, what I did wrong and what I would have done differently. I highly recommend and encourage others to take the course for the lifelong value in the lessons provided and the opportunity for personal growth gained. Thank you Marcie for sharing your experience with the Quad City Leadership Academy! Want to know more about QCLA or sign up? Call the Marketing Office at 563-359-1099.